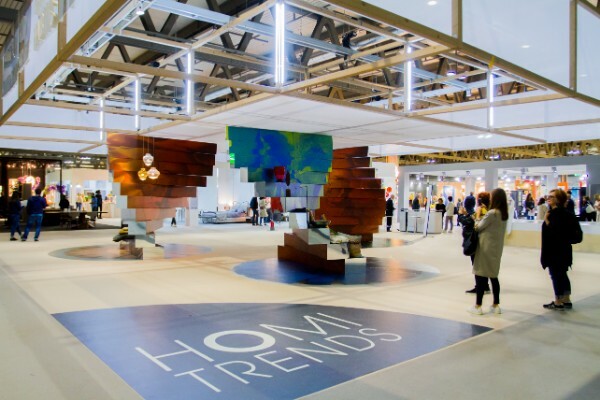 The tenth edition of the Fiera Milano Lifestyle Trade Fair will take place in September amidst new experimentations, trends and creativity. HOMI, the Fiera Milano Lifestyle Trade Fair dedicated to decorative elements for the home and personal accessories, will be back from 14 to 17 September 2018, with endless new stylistic ideas thanks to the extensive exhibition proposal that characterises the event, renowned for its strong and unmistakable personality. Now in its tenth edition, the exhibition that bears witness to changing styles has cemented its status as a privileged observatory on lifestyle-related trends. The home has always been the focus of our attention and is the no. 1 priority for 74% of Italians (source: DOXA). The Lifestyle Trade Fair therefore becomes an occasion to see the various trends and sub-cultures that guide today's stylistic evolutions become a reality. Today’s increasingly atomised society makes each and every one of us master of our own personal style, with our homes representing freedom of expression through objects that depict our cultures, experiences and identities. To relay all or this, HOMI will once again come alive with an extensive and transversal product offering: accessories and decorative home furnishings, tableware, fabrics and textiles for the home, essences and fragrances for the ambient, as well as promotional items, gift ideas and decorative objects for the office and special events. Alongside homeware, there will also be a vast space dedicated to personal items, including fashion accessories and bijoux. Here, creativity reigns supreme, with endless materials and infinite possible shape combinations. A continually evolving mosaic that will feature an even greater focus on experimentation and research; special pathways and spaces that combine traditions and revamped elaborations, where visitors will find original and exclusive creations. Numerous workshops, conferences and talk shows will breathe life into each individual exhibition sector, representing a highly formative moment for industry players, as well as an opportunity to meet up and exchange views and ideas on topics dear to the Lifestyle Trade Fair. Not simply an exhibition event, HOMI is also an occasion where visitors can directly explore the styles that come alive through events and exclusive initiatives. Amidst experimental areas, exhibitions and symbolic spaces designed to inspire the operators in terms of new trends, the Lifestyle Trend Fair explores different worlds, seeing them coexist and evolve edition after edition. The HOMI Trend Area will therefore be making a comeback. The space, organised alongside WGSN, the international leading company in market analyses, style forecasts and the consumer, will host the up-and-coming seasons’ most interesting trends. An essential ‘logbook’ to best understand where lifestyle trends are heading. The scientific-cultural partnership between HOMI and Polytechnic University of Milan – has been confirmed for the third consecutive edition, to organise HOMI Hybrid Lounge area. Fruit of important research activities on new trends in Interior Design and innovative materials, HOMI Hybrid Lounge will once again be an informal space for discussion, imbued by the fluidity of contemporary living. Personalisation, dematerialisation and fusion are just some of the keywords that will contribute to create a ‘hot zone’, where materials will establish poetic relationships with their users. POLI.design has invited a number of different sector companies to propose settings, innovative samplings and talks. Mirabilis Vitrum - Vetri D'italia is instead the title of La Magnifica Forma, the experimental HOMI laboratory dedicated to the comparison between design and arts and crafts, which, in its tenth edition, will be devoted to glass working, an activity boasting long-standing traditions and profound historical roots. The installation will present a suggestive showcase on manufacturing in various regional districts and traditional glass-working: from crystal to coloured glass, from borosilicate to blown or printed glass. A transverse journey spanning the length of Italy through the exhibition of both classic and contemporary pieces. There will also be countless new offerings in the special areas, where HOMI focuses on specific themes. These include DA UNO A CENTO, with the most original limited-edition self-productions and HOMI CREAZIONI, with the premium quality design and craftsmanship proposals of Italian and international companies, selected for their outstanding technical and research capacities, where visitors will discover innovative offerings and interesting revisited elaborations. Last but not least, EDITORA TESSILE will feature innovation and essential textile product trends that will expand the home textiles segment already present at HOMI with the addition of outstanding finished products. HOMI FOOD will instead be dedicated to high-quality agro-food production with strong links to research in terms of both product and packaging, a space where food becomes an innovative gift idea and an ‘object’ inspired by the design industry.